Kindermusik introduces your child to the joy and adventure of music and then moves at his pace, pausing to engage his interests, nurture his gifts, and celebrate his discoveries. From birth through age seven, with the caring guidance of a trained and licensed Kindermusik educator, your child can grow and learn without pressure to perform, only encouragment to explore and discover. You’ll witness a developmental evolution in language skills, literacy, listening, problem solving, social skills, self-esteem and a love of music! 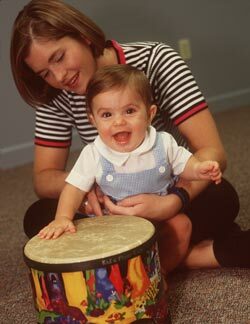 Kindermusik uses the power of music to develop the individual your child was born to be. With every class, your Kindermusik At Home materials include the highest quality music recordings on CD-a diversity of vocal and instrumental arrangements that will delight your whole family. While materials vary with each program, you’ll enjoy creative activities, children’s literature from the Kindermusik Library, and specially designed instruments-all created to complement and extend your child’s learning at home. Kindermusik classes will empower you as a parent. Life is busy, and family time together is a precious commodity. A Kindermusik class is truly the essence of "quality time," offering you a place to create special memories with your child and gain new insights into your child’s development. You will discover a unique sense of community and belonging in the Kindermusik classroom. Not only will your child blossom in this environment, but you will come to appreciate the support and friendship from the other adults in class. No other single activity offers the integrated, creative, child-centered experience that Kindermusik does. Music makes the difference. Invest in your child’s future by making early music exposure a priority. Research indicates a link between music and early learning, but Kindermusik creates a musical learning environment so powerful that you and your child will likely carry a love of music and early learning, for the rest of your lives. Kindermusik has been creating magical, musical memories for children and their families for more than 25 years. Come see how Kindermusik will make a lifetime of difference for your family! a whole world of new possibilitiesfor your child, for yourself, for life!